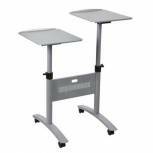 Nobo Grey Multimedia Projection Trolley Cabinet 1902339 Pack of 1 Multi-diameter cabinet with 4 shelves, steel front door and 2 rear steel doors. Also features cable management at the top and sides, an area for the electrical box and 4 strong castors, 2 of which are lockable. Dimensions: H950 x W570 x D600mm. 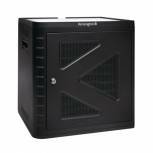 Kensington Charge and Sync Cabinet Black K67862EU Pack of 1 Kensington Charge and Sync Universal Cabinet. Space for up to 10 devices including iPads, Galaxy Tabs, Kindles and more. Adjustable drawers and a rugged protective case. Stack up to 3 together. 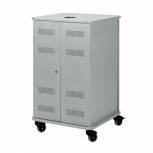 Lockable door for secure storage and charging.